How does The Last Ring Home relate to many baby boomer stories? 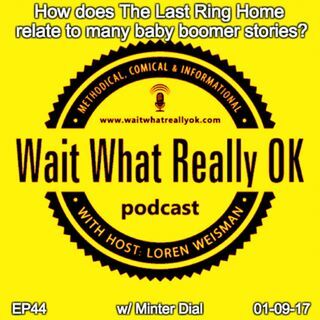 Wait What Really OK Podcast Episode 44 hosted by Brand Precision Marketing Strategist and Counselor, Loren Weisman talks with Minter Dial about his book and documentary film, The Last Ring. Beyond the book and the film, the message here is something many baby boomers can relate to or for that matter, almost anyone that has let things go but always wanted to find out more. To become a sponsor or an exhibitor at the event: Email tctradeexpo@gmail.com or visit: http://tctradeexpo.com/ today. Podcast Blog Supplement for Episode 44 of the Wait What Really OK Podcast with Loren Weisman. Podcast Link Supplement for Episode 44 of the Wait What Really OK Podcast with Loren Weisman. Why should you keep a foot in the past & the other in the future? Podcast Video Supplement for Episode 44 of the Wait What Really OK Podcast with Loren Weisman. Podcast Photo Supplement for Episode 44 of the Wait What Really OK Podcast with Loren Weisman.